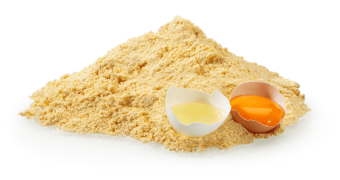 Powdered eggs are fully dehydrated eggs. They are made using spray drying in the same way that powdered milk is made. 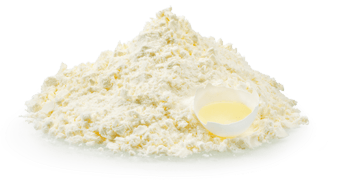 The major advantages of powdered eggs over fresh eggs are the price, reduced weight per volume of whole egg equivalent, and the shelf life. Other advantages include smaller usage of storage space, and lack of need for refrigeration. Powdered eggs can be used without rehydration when baking, and can be rehydrated to make dishes such as scrambled eggs and omelettes. Powdered eggs appear in literature, as a staple of camp cooking, at least as early as 1912. Powdered eggs were used in the United Kingdom during World War II for rationing. 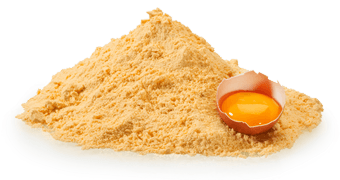 Powdered eggs are also known as dried eggs, and colloquially during the period of rationing in the UK, as Ersatz eggs. The modern method of manufacturing powdered eggs was developed in the 1930s by Albert Grant and Co. of the Mile End Road, London. This cake manufacturer was importing liquid egg from China and one of his staff realised that this was 75% water. An experimental freeze-drying plant was built and tried. Then a factory was set up in Singapore to process Chinese egg. As war approached, Grant transferred his dried egg facility to Argentina. The British Government lifted the patent during the war and many other suppliers came into the market notably in the United States. The Chinese were airdrying eggs that had been whipped and left in the sun to dry and then ground since the Middle Ages. [clarification needed dynasty] Early importers to the United States included Vic Henningsen Sr. and others in the United Kingdom.